Clash examines the house codes explored this season. House codes and signature handwriting: knowing what you do best and the strongest way to translate that into something new and exciting is something every fashion label has to negotiate, the merging of the two part and parcel of a label’s aesthetic trajectory. And while there are times when to completely rewrite the book is the most appropriate action, in a market that increasingly welcomes ‘see now buy now’ on a tightened schedule, commercial prowess is a more essential tool than ever before, something London’s designers were apparently keenly aware of for SS17 (to, visually at least, brilliant effect). Take Ryan Lo, the Hong Kong born London based proud Fashion East alumni, who dedicated this season’s collection to his personal fashion hero Sonia Rykiel, following her passing at the end of last month. Lo is known for a highly feminine aesthetic and a consistency where skirts and frocks are concerned, plus a thing for knits. 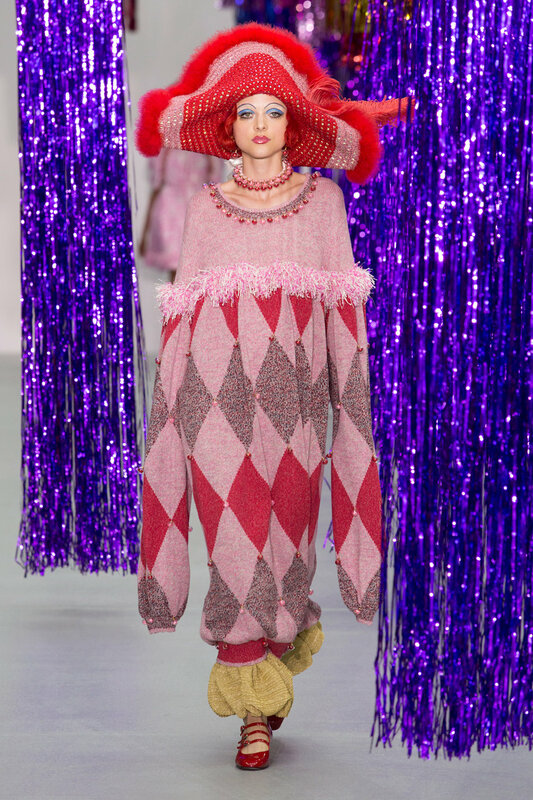 All of which came through this season, albeit under a new, Venetian clown leaning guise, set against a backdrop of metallic pink and purple streamers, the work of set designer Gary Card, a long time collaborator of Lo’s. Once dabbling exclusively in fantastic faux fur coats, this season saw Shrimps’ founding product take a backseat, as embroidery and gingham claimed focus. Hardly obsolete, those fake furs present took the form of stoles and mid-length coats, with girlish ribbons as fastenings, while elsewhere designer Hannah Weiland’s illustrations continued to reign supreme, adopted by simple square handbags, silk apparel, and as embroidered characters on translucent white dresses. At Ashley Williams the word, or name, was River Phoenix, quotes from whom filled the press release and pictures of whom were photocopied live, as part of the set (as well as the two models on that duty, another hacked away at her hair while a fourth watched TV and a fifth played paparazzi to the models striding past). Want, need, absolutely must have were common thoughts during Williams’ fifth solo show. Marrying Louise Gray esc bra’s over tees with more ‘street’ led hoodies and coach jackets, the designer played with palettes, prints and knits that were HappyAshleyLand through and through, while a brilliantly cut grey suit payed tribute to last season’s tailoring focus. Irish designer Richard Malone – presenting as part of Fashion East for a third season – displayed a Swedish leaning palette of yellow and blue interrupted by hints of orange and white, all of which adorned the body via slim fitting silhouettes, given a leg up by upper body cut outs, hemline slits and exaggerated 3D swirling necklines. Stripes and piping proposed key details, while cycling shorts became a realistic possibility in a collection that was full of quality. Malone also, quietly, had some of the best, and most diverse, casting of the season. 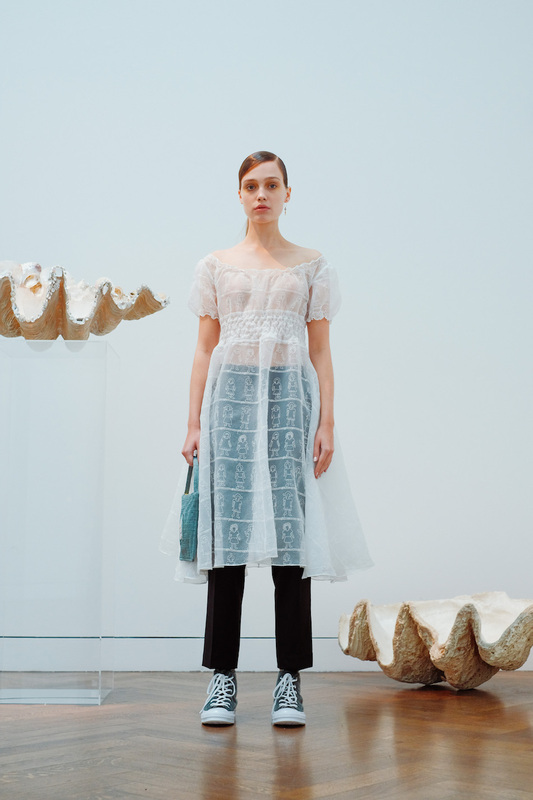 At Faustine Steinmetz, we arrived at an aquarium of sorts, as models doused in blue lay mermaid like either side of a white tunnel. 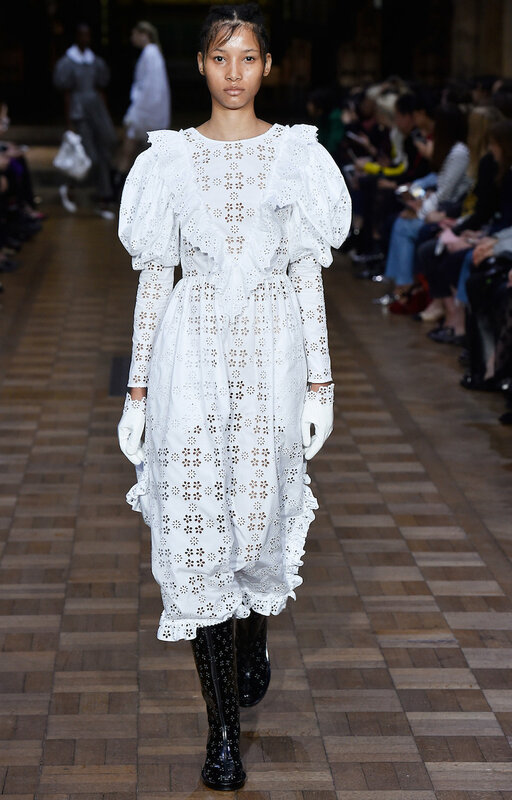 Titled simply ‘Blue Denim’, this season the Parisian introduced branding in a big way, with her name repeat printed on trousers, jackets and shoes; elsewhere a collaboration with Swarovski saw jewels dropped on see through chiffon preserving models’ modesty. “Denim is at the core of our ideology and continues to act as a canvas for experimentation,” noted the press notes that followed. 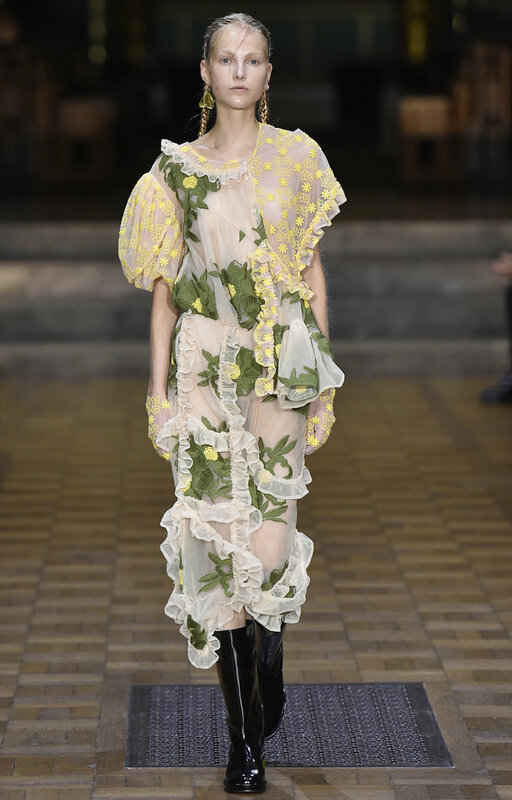 Simone Rocha rarely fails to make at least one jaw drop, and this season was no different. Presenting at Southwark Cathedral and tapping Mmoths to produce the accompanying soundtrack, a recognisable assembly of the beautiful and the emotional (we’re talking garments here) strode past, as Rocha played with collage and asymmetric lines, Broderie Anglais and lace and layering. At Molly Goddard the key term was exciting, or rather, EXCITING. 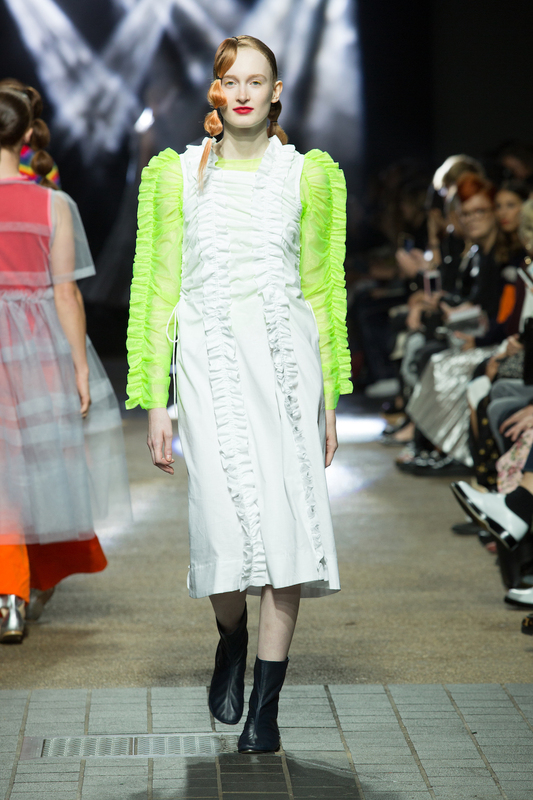 Making her catwalk debut, words like rave, nostalgia and modern were also made relevant via the sartorial offerings on show: neon frocks, textured gingham, photo printed jersey all claimed contemporary desirability, while attributes like ruching and tulle observed house rules. The swaying/raving/disco/party party finale was similarly all of the fun. 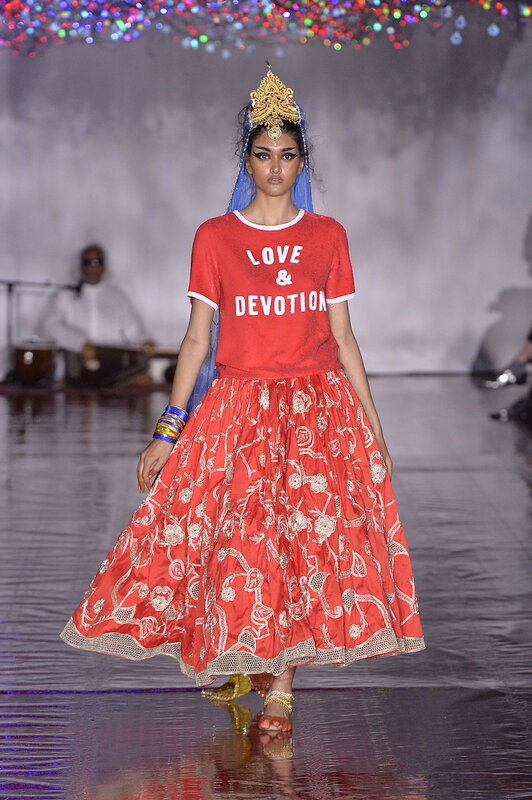 It was a passage from the Persian poet Rumi’s ‘Like This’, that covered benches at Ashish, printed on the reverse of the credit sheet in place of a formal press release. 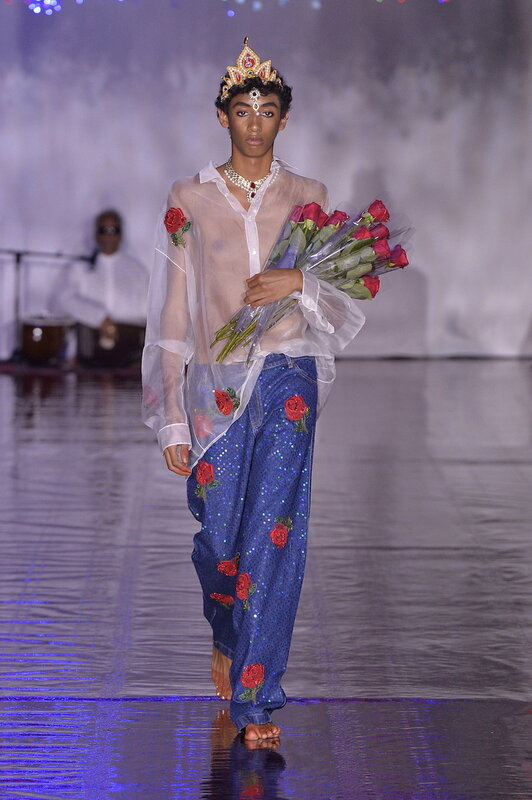 Another designer to indulge his own sartorial references (which for Ashish Gupta means sequins), what the audience actually witnessed was rooted in something much deeper than trends. 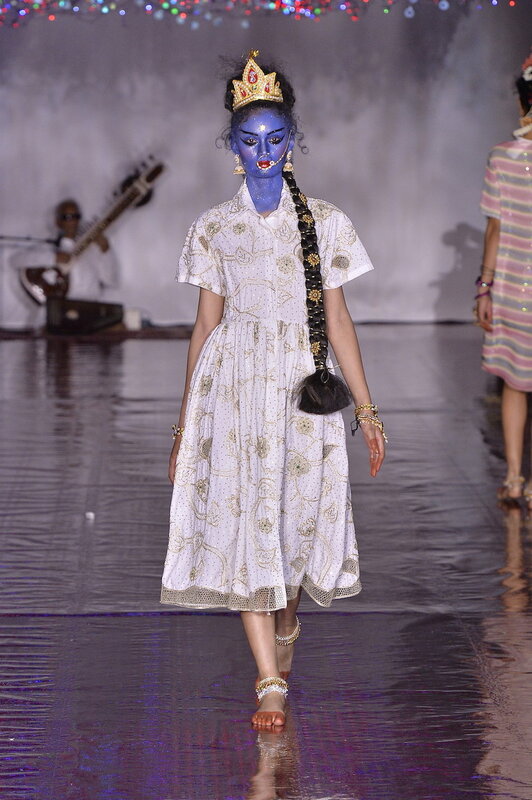 Dipping instead into religion, culture and politics, Gupta’s first post-Brexit display married the West with his native Delhi; Neelam Gill opened, while Isamaya Ffrench created make-up looks that nodded to Hinduism, and Gupta took his bow in a simple tee that shouted ‘Immigrant’. 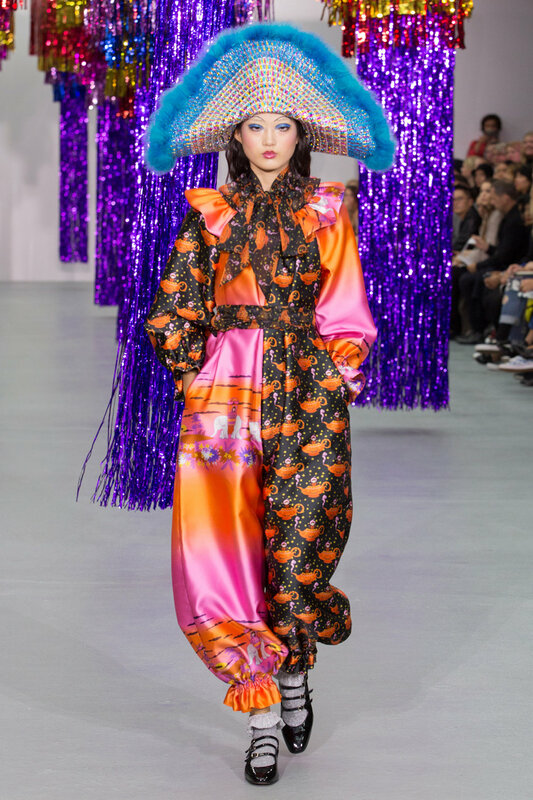 Bold and raising questions, the Ashish way.